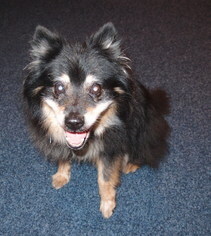 Ukko is an 8 year old Pom who is cute as a button! He is very sweet; he loves belly rubs, loves to cuddle and loves to be held like a baby! Ukko is looking for his forever home. If you think it could be yours, read more about Adopting from BDRA before submitting your application below. BDRA relies on your donations to rescue blind dogs around the United States. Please consider giving in support of Ukko. Ukko is deaf. He currently lives with two other dogs without issue. Ukko had been living outside at his previous owner’s; therefore, he is getting accustomed to being indoors. Ukko does have accidents but has made progress in the two weeks that I have had him. A schedule is going to be the answer in getting him fully house trained. He is older so does require going out more often.